What medicines are you taking? Track your medications including dosage, schedule and diagnosis. Record your prescription numbers, too. Fact-filled fold-up guide to interesting and informative topics. 8 panels front and back fold to credit card size. Materials: Paper Size : 2-1/8"w x 3-3/8"h (folded) Imprint Area: Back, 1-3/8"w x 2-1/2"h, 2 color(s) max Packaging: Bulk (ships flat) Pack Of: 3000 Weight: 28 lbs. What do you do for bleeding, burns or choking? Medical emergencies require a cool head and knowing the basics of first aid. Plus a must-have first aid supply list. Fact-filled fold-up guide to interesting and informative topics. 8 panels front and back fold to credit card size. Materials: Paper Size : 2-1/8"w x 3-3/8"h (folded) Imprint Area: Back, 1-3/8"w x 2-1/2"h, 2 color(s) max Packaging: Bulk (ships flat) Pack Of: 3000 Weight: 28 lbs. Get ready to help - follow the illustrated steps and learn the basics of these lifesaving methods. Includes information on CPR, CPR for infants, rescue breathing and other life saving skills. Fact-filled fold-up guide to interesting and informative topics. 8 panels front and back fold to credit card size. Materials: Paper Size : 2-1/8"w x 3-3/8"h (folded) Imprint Area: Back, 1-3/8"w x 2-1/2"h, 2 color(s) max Packaging: Bulk (ships flat) Pack Of: 3000 Weight: 28 lbs. The different types of stress, physical, psychological and behavioral are covered. Plus ways to cope including exercise and relaxation methods. Fact-filled fold-up guide to interesting and informative topics. 8 panels front and back fold to credit card size. Materials: Paper. Size : 2-1/8"w x 3-3/8"h (folded). 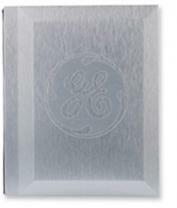 Imprint Area: Back, 1-3/8"w x 2-1/2"h, 2 color(s) max. Packaging: Bulk (Ships Flat) Pack Of: 3000 Weight: 28 Lbs. Keep track of your health. Follow your doctor's appointments medications, medical conditions and allergies. Great tips on staying healthy, too. Fact-filled fold-up guide to interesting and informative topics. 8 panels front and back fold to credit card size. Materials: Paper Size : 2-1/8"w x 3-3/8"h (folded) Imprint Area: Back, 1-3/8"w x 2-1/2"h, 2 color(s) max Packaging: Bulk (ships flat) Pack Of: 3000 Weight: 28 lbs. 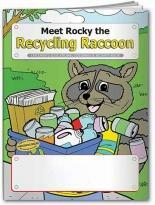 Rocky says that recycling is really important for all of the people and animals on the planet and shows how to get started in a recycling program. 16-pages with complete storyline Creative characters teach valuable lessons. Product is CPSIA compliant. Materials: Paper. Size : 8"w x 10-1/2"h Imprint Area: Front, 5"w x 1-1/2"h, 2 color(s) max. Packaging: Bulk Pack Of: 350 Weight: 25 Lbs. 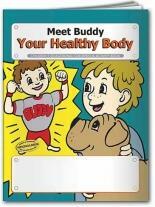 Buddy explains how to keep your body healthy and strong by eating right and exercising! 16-pages with complete storyline Creative characters teach valuable lessons. Product is CPSIA compliant. 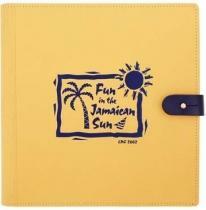 Materials: Paper Size : 8"w x 10-1/2"h Imprint Area: Front, 5"w x 1-1/2"h, 2 color(s) max. Packaging: Bulk Pack Of: 350 Weight: 25 Lbs. 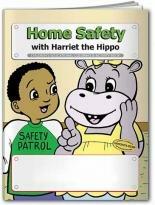 Harriet takes kids on a home safety patrol room-by-room to make their homes safer. 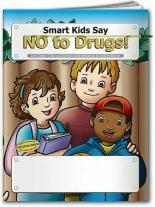 16-pages with complete storyline Creative characters teach valuable lessons. Product is CPSIA compliant. Materials: Paper Size: 8"w x 10-1/2"h Imprint Area: Front, 5"w x 1-1/2"h, 2 color(s) max. Packaging: Bulk Pack Of: 350 Weight: 25 lbs. 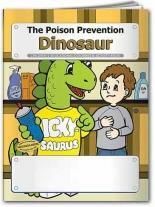 Without being scary, Ickysaurus tells kids that many things in their homes can be poisonous and how to avoid them. 16-pages with complete storyline Creative characters teach valuable lessons. Product is CPSIA compliant. Materials: Paper Size : 8"w x 10-1/2"h Imprint Area: Front, 5"w x 1-1/2"h, 2 color(s) max. Packaging: Bulk Pack Of: 350 Weight: 25 lbs. 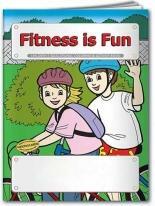 Kids discover that there are lots of ways to get fit, stay healthy and have fun with fitness. 16-pages with complete storyline Creative characters teach valuable lessons. Product is CPSIA compliant. Materials: Paper. Size : 8"w x 10-1/2"h Imprint Area: Front, 5"w x 1-1/2"h, 2 color(s) max. Packaging: Bulk Pack Of: 350 Weight: 25 lbs. Did you know about "good stress" and "bad stress"? Learn the difference in addition to discovering how sleep, exercise, good nutrition and laughter help you cope. Interactive slide chart Great for mailings, trade shows, take-alongs. Materials: Paper. 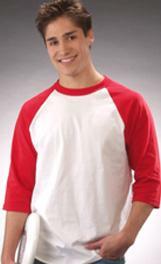 Size: 3-3/4"w x 8-1/2"h. Imprint Area: Front, 2-1/4w" x 1-1/8"h, 2 color(s) max. Packaging: Bulk Pack Of: 500 Weight: 21 lbs. Healthy eating is about more than dieting. Learn ways to cook healthy foods, eat smart and exercise. Plus information on Body Mass Index. Interactive slide chart Great for mailings, trade shows, take-alongs. Materials: Paper. Size: 3-3/4"w x 8-1/2"h. Imprint Area: Front, 2-1/4w" x 1-1/8"h, 2 color(s) max. Packaging: Bulk Pack Of: 500 Weight: 21 lbs. Manage your diabetes with important information on how insulin works, insulin pumps, sugar levels and tips for healthy eating at home and while dining out. Interactive slide chart Great for mailings, trade shows, take-alongs. Materials: Paper. Size: 3-3/4"w x 8-1/2"h. Imprint Area: Front, 2-1/4w" x 1-1/8"h, 2 color(s) max. Packaging: Bulk Pack Of: 500 Weight: 21 lbs. It's important to choose the right gym, diet, and exercise. Plus sections for seniors, kids and a chart to help calculate target heart rate. Interactive slide chart Great for mailings, trade shows, take-alongs. Materials: Paper. Size: 3-3/4"w x 8-1/2"h. Imprint Area: Front, 2-1/4w" x 1-1/8"h, 2 color(s) max. Packaging: Bulk Pack Of: 500 Weight: 21 lbs. Tracking your cholesterol is a vitally important part of staying healthy. Discover tips on "good" and "bad" cholesterol, risk factors and what foods to eat or avoid. Interactive slide chart Great for mailings, trade shows, take-alongs. Materials: Paper. Size: 3-3/4"w x 8-1/2"h. Imprint Area: Front, 2-1/4w" x 1-1/8"h, 2 color(s) max. Packaging: Bulk Pack Of: 500 Weight: 21 lbs. Learn what to do when it's time for your teen to get behind the wheel. Tips on driver's education, permits and unsafe driving behaviors to discuss with your teen. Plus ten ways to keep your teen safe while driving. Interactive slide chart Great for mailings, trade shows, take-alongs. Materials: Paper. Size: 3-3/4"w x 8-1/2"h. Imprint Area: Front, 2-1/4w" x 1-1/8"h, 2 color(s) max. Packaging: Bulk Pack Of: 500 Weight: 21 lbs. Learn warning signs and symptoms of cervical cancer plus types of the disease, risk factors and treatment options. Includes information on new options for prevention and where to get help. Interactive slide chart Great for mailings, trade shows, take-alongs. Materials: Paper. Size: 3-3/4"w x 8-1/2"h. Imprint Area: Front, 2-1/4w" x 1-1/8"h, 2 color(s) max. Packaging: Bulk Pack Of: 500 Weight: 21 lbs. 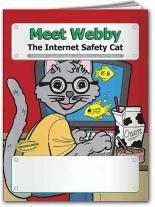 The whole world is just a click away on the Internet - and Webby shows kids the rule on how to stay safe while online. 16-pages with complete storyline Creative characters teach valuable lessons. Product is CPSIA compliant. Materials: Paper Size : 8"w x 10-1/2"h Imprint Area: Front, 5"w x 1-1/2"h, 2 color(s) max. Packaging: Bulk Pack Of: 350 Weight: 25 lbs. 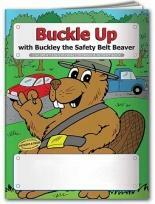 Safety belts are happy when everyone gets into their cars or trucks and they buckle up! Buckley explains why it's so important. 16-pages with complete storyline Creative characters teach valuable lessons. Product is CPSIA compliant. Materials: Paper Size : 8"w x 10-1/2"h Imprint Area: Front, 5"w x 1-1/2"h, 2 color(s) max. Packaging: Bulk Pack Of: 350 Weight: 25 lbs. "Why would anyone be dumb enough to take drugs, drink alcohol or smoke, which messes absolutely everything up?" asks this book in a straightforward witty style. 16-pages with complete storyline Creative characters teach valuable lessons. Product is CPSIA compliant. Materials: Paper Size : 8"w x 10-1/2"h Imprint Area: Front, 5"w x 1-1/2"h, 2 color(s) max. Packaging: Bulk Pack Of: 350 Weight: 25 lbs. Whether it's home sales or services, keep your name front and center! Material : White flexible magnetized vinyl, approximately .020" or .030" thick, .020" furnished unless specified. Size : 1 7/8" x 2 1/2" Imprint Area : Color may bleed. Additional Color: (250)$0.69,(500)$0.445, (1,000)$0.265, (1,500)$0.1875, (2500)$0.12 Shipping Weight - Approximate per 250: 8 1/2 lbs. Handy, pocket sized first aid book with emergency room and 9-1-1 guidelines. Basic first aid guidelines for bumps, bruises, bite, burns and more. 36-page pocket health guide. Room to write notes and record important information. Materials: Paper. Size : 3-3/4"w x 6"h. Imprint Area: Front, 2-1/4"w x 1-1/8"h, 2 color(s) max. Packaging: Bulk Pack Of: 400 Weight: 30 lbs. Reference guide to developing healthy eating habits. Let the book be your mission to good health. 36-page pocket health guide. Room to write notes and record important information. Materials: Paper. Size : 3-3/4"w x 6"h. Imprint Area: Front, 2-1/4"w x 1-1/8"h, 2 color(s) max. Packaging: Bulk Pack Of: 400 Weight: 30 lbs. Hit the links and lower your score. Information on the game of golf and ways to calculate your USGA handicap. 24-page accordion fold with vinyl sleeve. Materials: Paper Size: 3"w x 7-1/2"h. Imprint Area: Front (Standard): 2-1/4"w x 1-1/8"h, 2 color(s) max Packaging: Bulk Pack Of: 350 Weight: 27 lbs. 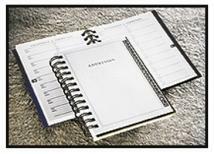 Telephone Directory, Keep your contacts close and at hand by adding a handy telephone section to any 5" x 7" Journalbook product, The printed index tabs make for fast and easy reference, and the entire seciton can be bound in either the front or back of your product. 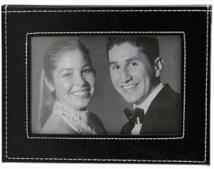 Size : 5" x 7"
4 x 6 Photo Memory Box with 3 1/2" x 5" photo hole on cover, box holds 24 photos. 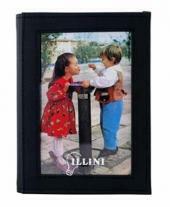 Size : 5" x 6 1/2" x 1 3/4"
Photo address book with A-Z index tabs, holds 1 photo. Insert/Photo Size : 5" x 7" (with protective sleeve on front cover) Size : 5 7/8" x 7 7/8"
CDNotes. One CD sleeve in front followed by 70 sheets of ruled, 100% recycled, 60# quality writing paper. Choose from cover Series 2. Black binding wire is standard. White, silver, or bronze wire optional. Made in USA. Size: 5.25" x 5.75"
Environment: 'Green is Good' Thought Journals: ENJOY MORE, USE LESS. "Little things make a big difference." The thoughts in this notebook celebrate personal accountability, "green team" thinking and the power of the individual. When it comes to building a healthy planet and a sustainable lifestyle, it takes each of us to make a difference for all of us. Alone we can do so little; together we can do so much. Our pocket-sized thought books feature a compelling eco-fact, green tip or inspiring quotation on each page spread. Made from 100% post-consumer waste paper and printed with soy inks, each page offers space to take notes, jot down ideas or make plans. Softcover, 224 pages. Size : 3.5" x 5.125" Customization additional - call for pricing. 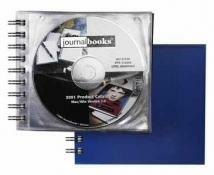 2 1/2 x 3 1/2 Self Stick Album E-Z Peel and stick pages, Holds 10 prints. Primetime leather photo album with snap closure. 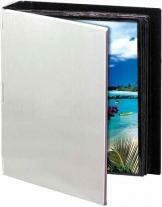 Holds 36 (4" x 6") photographs. Product Size: 7" x 4 1/2" Standard: 2-piece black gift box Imprint Area: Debossed Front Center 2 1/2" x 1 1/2" Debossed Bottom right corner 2" x 1 1/2"
Brushed aluminum photo album, Holds 60 4 x 6 pictures. Size(s): 5 1/2" x 6 3/4" Imprint: 3 x 3 Additional Information: Prices include one color, one position imprint. 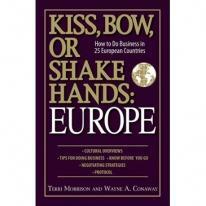 Business Bestsellers: Kiss, Bow, or Shake Hands: Europe: How to Do Business in 25 European Countries. Kiss, Bow, or Shake Hands: Europe reveals the subtleties of interaction, negotiation strategies, and professional skills you need to keep poised for success in your business travels, As Americans embark on more global business, we must understand the culture and customs behind the vast economic growth in Europe, Learn everything you need to know about the business practices, cognitive styles, negotiation techniques, and social customs in 25 European countries, Give the right gift; make the right gesture. Softcover, 238 pages. Size: 5.5" x 8.5". Customization additional - call for pricing. 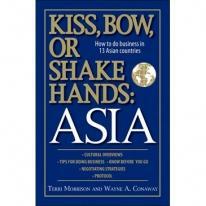 Business Bestsellers: Kiss, Bow, or Shakes Hands: Asia: How to Do Business in 13 Asiancountries. Kiss, Bow, or Shake Hands: Asia reveals the subtleties of interaction, negotiation strategies, and professional skills you need to keep poised for success in your business travels, As Americans embark on more global business, we must understand the culture and customs behind the vast economic growth in Asia. Learn everything you need to know about the business practices, cognitive styles, negotiation techniques, and social customs in Asia. Give the right gift; make the right gesture. Softcover, 222 pages. Size: 5.5" x 8.5". Customization additional - call for pricing. 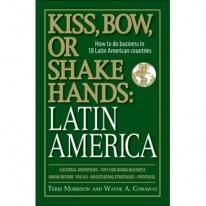 Business Bestsellers: Kiss, Bow, or Shakes Hands: Latin America: How to Do Business in 18 Latin American Countries. Kiss, Bow, or Shake Hands: Latin America reveals the subtleties of interaction, negotiation strategies, and professional skills you need to keep poised for success in your business travels, As Americans embark on more global business, we must understand the culture and customs behind the vast economic growth in Latin America. Learn everything you need to know about the business practices, cognitive styles, negotiation techniques, and social customs in Latin America, Give the right gift; make the right gesture. Softcover, 238 pages. Size: 5.5" x 8.5". Customization additional - call for pricing. 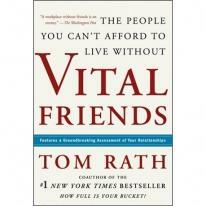 Business Bestsellers: Vital Friends: The People You Can't Afford to Live Without. On the surface, this book seems unnecessary: Who, after all, needs to be convinced of friendship's worth? But Tom Rath's Vital Friends actually breaks new ground by showing how cordial personal relationships enhance every aspect of the workplace and business. Drawing on extensive research, he demonstrates the benefits of friendships for office morale and success with clients. Hardcover, 218 pages. Customization additional - call for pricing. Business Bestsellers: The Triple Bottom Line: Why Sustainability is Transforming the Best-Run Companies and How it Can Work for You. In a survey of 900 global corporations released by PricewaterhouseCoopers in 2003, 80 percent of CEOs said they believe "sustainability" is or soon will be vital to the profitability of their company, and 71 percent said they would consider sacrificing short-term profits to move their company towards sustainability-a sure sign that the world's leading CEOs see it as the corporate model of the future. Just what is sustainability? In a nutshell, it is a management principle that aims to create long-term shareholder value by seizing opportunities and managing risks related to the economic, environmental, and social impact of doing business. By putting the profit motive alongside a concern for the environment and for people, this movement has created what we [unclear who "we" is-the author?] call a "win-win-win" situation. Its leaders are solidly in the Fortune 100-companies like General Electric, DuPont, BP, Pfizer, and HP-and it is rapidly spreading to all companies that are looking towards a sustainable business model. The Triple Bottom Line is the first book to chart the rise of sustainability, identify and explain the new paradigm, and show organizations, of all sizes and industries, exactly how they can benefit from it. 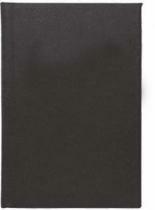 Hardcover, 320 pp, Size: 9 x 6.5," Customization additional - call for pricing. 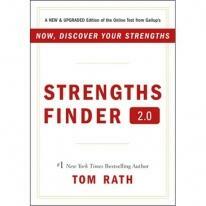 Business Bestsellers: Strengths Finder 2.0. DO YOU DO WHAT YOU DO BEST EVERY DAY? Chances are, you don't. From the cradle to the cubicle, we devote more time to fixing our shortcomings than to developing our strengths, To help people uncover their talents, Gallup introduced StrengthsFinder in the 2001 management book Now, Discover Your Strengths. The book ignited a global conversation, while StrengthsFinder helped millions discover their top five talents. In StrengthsFinder 2.0, Gallup unveils the new and improved version of its popular online assessment. With hundreds of strategies for applying your strengths, StrengthsFinder 2.0 will change the way you look at yourself—and the world—forever, Hardcover, 192 pages. Customization additional - call for pricing. Leather album with knob lappet closure. Refillable thanks to its snap-in photo booklet. 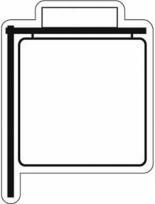 12 archival black plastic photo sleeves. landscape - 2 up (48 views 4" x 6"). Size: 8" x 9"